We have had fintech and now we have femtech. Ida Tin, founder/CEO of our portfolio company Clue, explains it in less than two minutes. USV has several femtech investments and we would love to make even more. As we think about how to modify the ACA (aka Obamacare) into something different (aka Trumpcare) I would encourage everyone involved to think about one central tenet – put the person/consumer/patient at the center of the system, not the employer, not the insurer, and not the doctor. I have written a few times about consumer centric healthcare here at AVC. I believe that patients should and will increasingly take control of their health care and that will be a good thing for costs and outcomes. Our healthcare investment strategy at USV is largely based on this premise. My partner Andy who has done a lot of the critical thinking that has informed our investments in this sector, wrote this post on his personal blog six months ago explaining how we think about this sector. Technology will have a lot to do with this. If the regulators will allow it. There are laws on the books in many states (NY State is among the worst) stopping patients from going around doctors and getting diagnostic tests, radiology exams, and, can you believe it, eye exams, using technology instead of humans. We must change those laws and I am involved in efforts to do just that. I would encourage others to engage on this issue. It’s important. Andy Kessler had a good piece a few weeks ago on all of this. He points out that a lot of the data we need to train machine learning models are stuck in data silos controlled by big companies like Epic Systems. If Trump and his people want to make a better healthcare system, they should require Epic and its competitors to provide open APIs into these data silos so that people/patients can get access to their data and authorize third party systems to have it too. That one move would be huge for AI in healthcare, which we need to get costs under control. Our problems in healthcare are largely structural. We have allowed employers and insurers to finance our healthcare system and take control of it. We need to get people back in control of healthcare. Technology can be the lever that will do that. If we allow it to happen. My partner Andy blogged this week about an investment we made earlier this year. It is called NuRx and its an entirely new way to get medications. When you need to see a doctor, there are typically 5 or 6 steps you need to take before a potential outcome: finding the doctor; finding time to schedule the appointment; visiting the doctor; getting a diagnosis and prescription; visiting a pharmacy and paying for your medication. The efficiency of scrolling through a mobile app, finding the medication you need, filling out some information, and then having the meds show up at your door a few hours later is vastly superior to the process Andy described. We are looking for services in health care that dramatically improve the user experience of obtaining health care services and lower the cost of providing those services. We also believe that these services, when delivered on the device you have with you all of your waking hours, will over time become an important repository of your personal heath care information. And one you control and have the primary access to. All of these things; improved user experience, dramatically lower costs, user control over their data, portability of providers, are a direct and aggressive challenge to the existing incumbent health care system. And I can’t think of any industry that deserves that challenge more than health care. My daughter’s iPhone can’t deliver a strep test to her, yet. But it can deliver an eye exam and a hearing test. 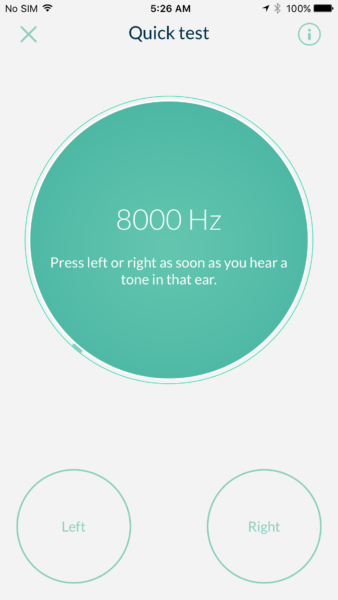 So I thought I would showcase one of these iPhone based medical tests on feature friday today. 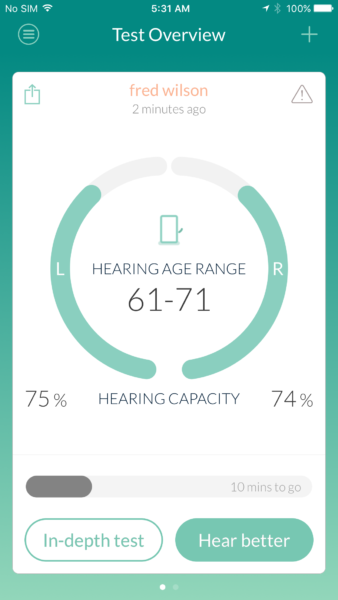 If you download an app on your iPhone called “Mimi Hearing Test” and install it, you can test your hearing with your earbuds. I did that this morning. It is just like the hearing tests you do at the doctor’s office. 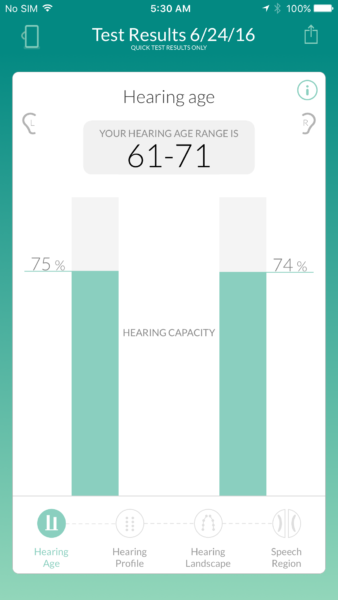 As I suffer from mild hearing loss, I have done this test a bunch in doctors offices over the years. You sit in a quiet spot and wait for beeps in your right or left ear and when you hear them you press the right or left button. 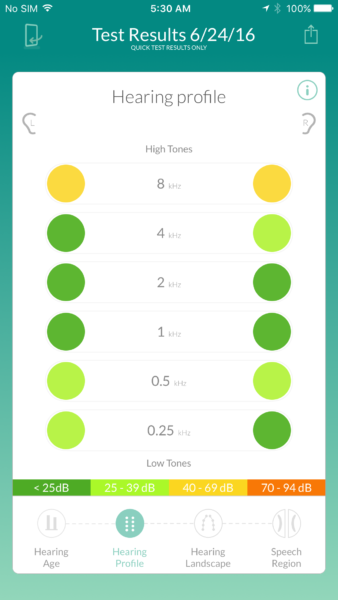 And, once you’ve done an in-depth test and stored that, you can use the Mimi Music app to enhance the music listening on your iPhone. I assume that is just the start of a suite of enhanced audio apps and products that Mimi intends to offer. Full disclosure – The Gotham Gal is an investor in Mimi and therefore I have a financial interest in the company too. My daughter went to see a doctor a month or so ago. She thought she had strep throat. The doctor checked her out and said that she did not think she had strep. My daughter wanted a strep test but the doctor talked her out of it. A week later, my daughter was back at the doctor with a massive case of strep throat. I told her the lesson of that experience was the the doctor works for her, not the other way around. I was reminded of that story when I read my partner Andy’s long and wonderful post on USV’s approach to investing in healthcare. People are the CEO of their health, and doctors are just consultants. And that is what I was explaining to my daughter last month. The good news is that technology is changing all of this. My daughter’s iPhone can’t deliver a strep test to her, yet. But it can deliver an eye exam and a hearing test. So I am confident strep will come to a phone someday. And in the process our phones are becoming our electronic medical records. But we own them. That’s a big deal. I am really into embed codes. I think the ability to take content and software from one app and inject it into another app is one of the coolest things about the Internet. Biodigital is a 3D visual model of the human body. Think of it as Google Maps for the body. I’ve had issues with my MCL in my left knee for the past five or six years. I slightly tore it and although it has healed, I still get pain in it from time to time. If you want to get lost in the human body for the next hour, go check out Biodigital. I’m a big fan of our portfolio company Clue which is trying to improve women’s reproductive health and planning with their super popular mobile app. Here’s a short video (< 2 mins) that was posted a couple days ago where founder Ida Tin explains why she started Clue. A month or two ago our daughter Jessica asked us to get 23andMe kits and get our genes sequenced. Jessica wants to add some information from our results to hers so she can better understand her own genetic makeup. So the Gotham Gal and I did it a few weeks ago and we are now awaiting the results. The 23andMe process requires that you set up a profile on their web service and answer some questions about yourself before submitting the saliva sample for processing. If you wish, you can give them a full health care profile which is almost exactly identical to the interview a new doctor will give you on your first visit (do you/did you smoke, do you/did you drink, are your parents alive, are they healthy, are you allergic to this and that, etc, etc). I went through the entire process and shared all of my medical history with 23andMe in great detail. So now 23andMe will have a full medical history/profile of me plus my genetic makeup. That’s pretty cool. I have some suggestions for them as a user. First, I wish that I could connect my profile on 23andMe with Jessica’s profile on 23andMe as her father. And I wish that I could connect my profile to the Gotham Gal as her husband. In summary, I would like for us to build a family tree on their service so that the work Jessica wants to do can be done automatically by their software. That seems like an obvious thing to do in a service like 23andMe, but I looked around pretty hard and could not figure out how to do that. Second, I would like to be able to authorize third party services (starting with my doctor’s Patient Fusion service) to access all of this genetic and medical information I have stored at 23andMe. I found the 23andMe API so that’s a good thing. But I could not find a marketplace of third party apps that connect to 23andMe via its API. That would be really useful. Another thing I would like to be able to do is sync my 23andMe data with my mom’s genealogy data that she keeps on Ancestry.com. I believe she has some basic genetic information there on herself. That would inform my profile in the same way that my data informs Jessica’s profile. The bottom line for me is that this data (genetic information and medical history) is really powerful stuff. It should not be held in silos. Users should have the power to move it around, connect it up, and share it with their medical providers, family members, and others who can benefit from this data. This is a big part of our thesis in health care. Users are starting to get control of their own medical data and decide how it will be used and by whom. That will lead to better outcomes for everyone. I am very excited by the potential of what can happen when this is really happening at scale. And that feels like it is right around the corner now. If you want to get a 23andMe kit, you can do that here. I think we can go further than that now and say that sometime in the past year or two the consumer internet/social/mobile gold rush ended. 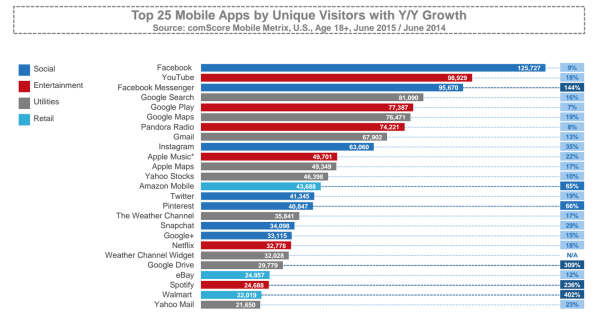 The top 6 mobile apps and 8 of the top 9 are owned by Facebook and Google. 10 of the top 12 mobile apps are owned by Apple, Facebook, and Google. There isn’t a single “startup” on that list and the youngest company on that list is Snapchat which is now over four years old. We are now well into a consolidation phase where the strong are getting stronger and it is harder than ever to build a large consumer user base. It is reminiscent of the late 80s/early 90s after Windows emerged as the dominant desktop environment and Microsoft started to use that dominant market position to move up the stack and take share in all of the important application categories. Apple and Google are doing that now in mobile, along with Facebook which figured out how to be as critical on your phone as your operating system. I am certain that something will come along, like the Internet did in the mid 90s, to bust up this oligopoly (which is way better than a monopoly). But it is not yet clear what that thing is. 2015 saw some of the candidates for the next big thing underwhelm. VR is having a hard time getting out of the gates. Wearables and IoT have yet to go mainstream. Bitcoin and the Blockchain have yet to give us a killer app. AI/machine learning has great potential but also gives incumbents with large data sets (Facebook and Google) scale advantages over newcomers. The most exciting things that have happened in tech in 2015 are happening in verticals like transportation, hospitality, education, healthcare, and maybe more than anything else, finance, where the lessons and playbooks of the consumer gold rush are being used with great effectiveness to disrupt incumbents and shake up industries. The same is true of the enterprise which also had a great year in 2015. Slack, and Dropbox before it, shows how powerful a consumerish approach to the enterprise can be. But there aren’t many broad horizontal plays in the enterprise and verticals seems to be where most of the action was in 2015. I’m hopeful that 2015 will also go down as the year we buried the Unicorn. The whole notion that getting a billion dollar price tag on your company was something necessary to matter, to be able to recruit, to be able to get press, etc, etc, is worshiping a false god. And we all know what happens to those who do that. As I look back over 2014 and 2015, I feel like these two years were an inflection point, where the underlying fundamentals of opportunity in tech slowed down but the capital rushing to get invested in tech did not. That resulted in the Unicorn phase, which if it indeed is over, will be followed by an unwinding phase where the capital flows will need to line up more tightly to the opportunity curve. I’m now moving into “What Will Happen” which is for tomorrow, so I will end this post now by saying goodbye to 2015 and hopefully to much of the nonsense that came with it. I did not touch on the many important things that happened outside of tech in 2015, like the rise of terrorism in the western world, and the reaction of the body politic to it, particularly here in the US with the 2016 Presidential campaign getting into full swing. That certainly touches the world of tech and will touch it even more in the future. Again, something to talk about tomorrow. I wish everyone a happy and healthy new year and we will talk about the future, not the past, tomorrow. Last year, I ended 2014 with What Just Happened and started 2015 with What Is Going To Happen. I’ll do the same tomorrow and friday, but today I’d like to talk about What Didn’t Happen, specifically which of my predictions in What Is Going To Happen did not come to be. I said that the big companies that were started in the second half of the last decade (Uber, Airbnb, Dropbox, etc) would start going public in 2015. That did not happen. Not one of them has even filed confidentially (to my knowledge). This is personally disappointing to me. I realize that every company should decide how and when and if they want to go public. But I believe the entire startup sector would benefit a lot from seeing where these big companies will trade as public companies. The VC backed companies that were started in the latter half of that last decade that did go public in 2015, like Square, Box, and Etsy (where I am on the board) trade at 2.5x to 5x revenues, a far cry from what companies get financed at in the late stage private markets. As long as the biggest venture backed companies stay private, this dichotomy in valuations may well persist and that’s unfortunate in my view. I said that we would see the big Chinese consumer electronics company Xiaomi come to the US. That also did not happen, although Xiaomi has expanded its business outside of China and I think they will enter the US at some point. I have a Xiaomi TV in my home office and it is a really good product. I predicted that asian messengers like WeChat and Line would make strong gains in the US messenger market. That most certainly did not happen. The only third party messengers (not texting apps) that seem to have taken off in the US are Facebook Messenger, WhatsApp and our portfolio company Kik. Here’s a shot of the app store a couple days after the kids got new phones for Christmas. I said that the Republicans and Democrats would find common ground on challenging issues that impact the tech/startup sector like immigration and net neutrality. That most certainly did not happen and the two parties are as far apart as ever and now we are in an election year where nothing will get done. So I got four out of eleven dead wrong. VR has hit headwinds. Oculus still has not shipped the Rift (which I predicted) and I think we will see less consumer adoption than many think when it does ship. I’m not long term bearish on VR but I think the early implementations will disappoint. The Apple Watch was a flop. This is the one I took the most heat on. So I feel a bit vindicated on this point. Interestingly another device you wear on your wrist, the Fitbit, was the real story in wearables in 2015. In full disclosure own a lot of Fitbit stock via my friends at Foundry. Enterprise and Security were hot in 2015. They will continue to be hot in 2016 and as far as this eye can see. There was a flight to safety in 2015 and big tech (Google, Apple, Facebook, Amazon) are the new blue chips. Amazon was up ~125% in 2015. Google (which I own a lot of) was up ~50% in 2015. Facebook was up ~30% in 2015. Only Apple among the big four was down in 2015 and barely so. Oil on the other hand, was down something like 30% in 2015 and gold was down something like 15-20% in 2015. Bitcoin had a big comeback in 2015. If you look at the price of Bitcoin as one measure, it was up almost 40% in 2015. However, we still have not see the “real decentralized applications” of Bitcoin and its blockchain emerge, as I predicted a year ago, so I’m not entirely sure what to make of this one. And to make matters worse, we now seem to be in a phase where investors believe you can have blockchain without Bitcoin, which to my mind is nonsense. Healthcare is, slowly, emerging as the next big sector to be disrupted by tech. The “trifecta” I predict will usher in an entirely new healthcare system (smartphone becomes the EMR, p2p medicine, and a market economy in healthcare) has not yet arrived in full force. But it will. It’s only a matter and question of when. So, I feel like I hit .500 for the year. Not bad, but not particularly impressive either. But when you are investing, batting .500 is great because you can double down on your winners and stop out your losers. That’s why it is important to have a point of view, ideally one that is not shared by others, and to put money where your mouth is.